Do some cultural sightseeing at Centre National d'Art et de Culture George Pompidou and Basilique du Sacre-Coeur de Montmartre. You'll explore and learn at Musee d'Orsay and Louvre Museum. Step out of Paris with an excursion to Palace of Versailles in Versailles--about 48 minutes away. 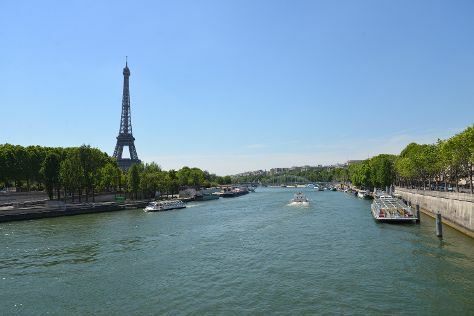 Next up on the itinerary: contemplate the long history of Eiffel Tower, appreciate the extensive heritage of Latin Quarter, pause for some serene contemplation at Cathédrale Notre-Dame de Paris, and head off the coast to Île de la Cité. To find other places to visit and other tourist information, use the Paris trip planner . If you are flying in from Brazil, the closest major airports are Paris-Orly Airport, Charles de Gaulle International Airport and Paris Beauvais Tillé Airport. Expect a daytime high around 30°C in July, and nighttime lows around 18°C. You'll have a few hours on the 9th (Tue) to wrap things up before traveling home.